Download "Solutions: Sample Exam 2: FINA 5500"
5 b. In what currency should the firm invest, and how much: (2,500,000 / 1.07) = BP 2,336, c. If the US firm sets up the money market hedge, how many US dollars would it need to cover the payment of S 2,500,000 payable at the end of one year? (2,500,000/1.07)*0.59*(1.05) = $1,447, d. Based on available information, should the firm use a forward hedge or money market hedge to cover the payment of S 2,500,000 payable at the end of one year? 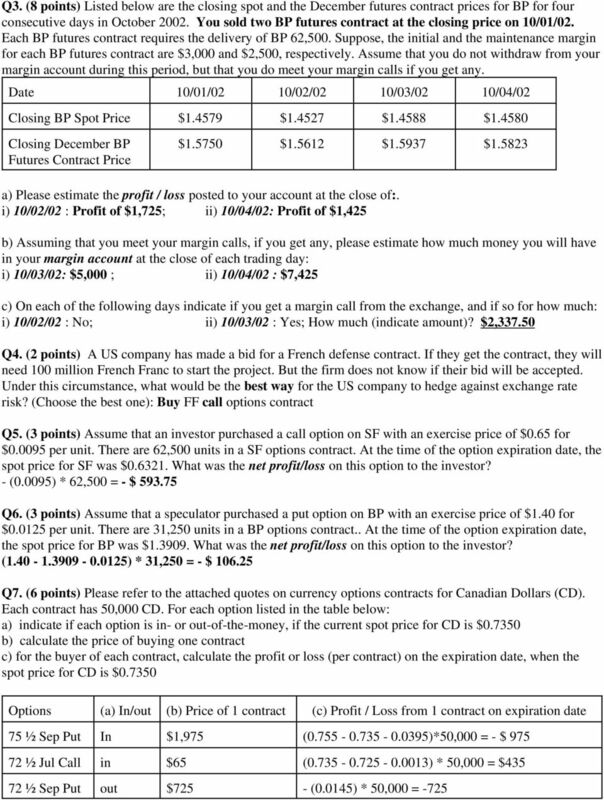 money market hedge Q14 (8 points): The following table projects inflows and outflows in four different currencies for Nemonics.com, a US based firm. Also given are the projected exchange rates for these currencies and their projected ranges. Based on this information, estimate the information required in the last four rows of the table. Euro Japanese Yen Hong Kong $ Mexican Peso Inflows 500,000 25,000, ,000 Outflows , ,000 Projected exchange rates $0.90 $0.01 $0.75 $0.10 Projected range of exchange rates $ $ $ $ $ $0.25 Projected $ NC + 450, ,000 <450,000> <40,000> Projected range of the $ NC +375, , , ,500 <330,000> <510,000> <8,000> <100,000> Projected overall $ NC $210,000 Projected range of the overall $ NC $524,500 - <47,500> B. 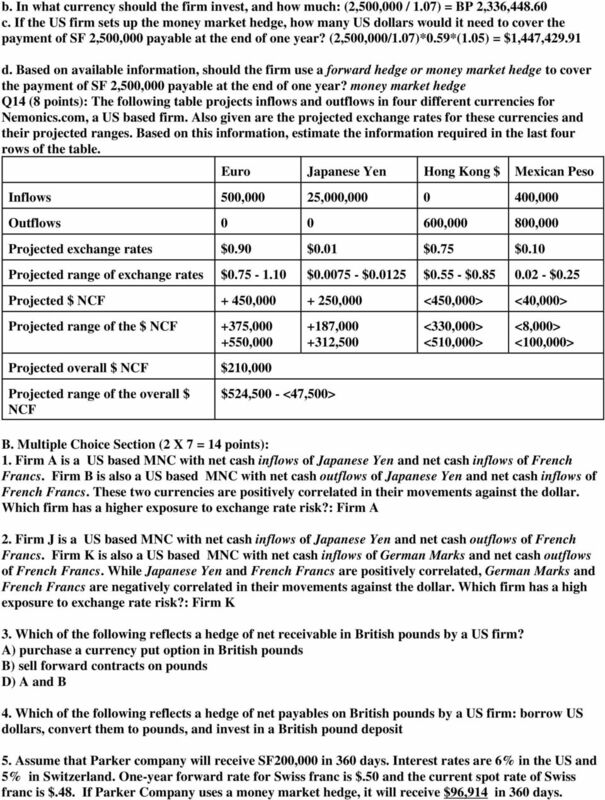 Multiple Choice Section (2 X 7 = 14 points): 1. irm A is a US based MNC with net cash inflows of Japanese Yen and net cash inflows of rench rancs. irm B is also a US based MNC with net cash outflows of Japanese Yen and net cash inflows of rench rancs. These two currencies are positively correlated in their movements against the dollar. Which firm has a higher exposure to exchange rate risk? : irm A 2. irm J is a US based MNC with net cash inflows of Japanese Yen and net cash outflows of rench rancs. irm K is also a US based MNC with net cash inflows of German Marks and net cash outflows of rench rancs. While Japanese Yen and rench rancs are positively correlated, German Marks and rench rancs are negatively correlated in their movements against the dollar. Which firm has a high exposure to exchange rate risk? : irm K 3. Which of the following reflects a hedge of net receivable in British pounds by a US firm? 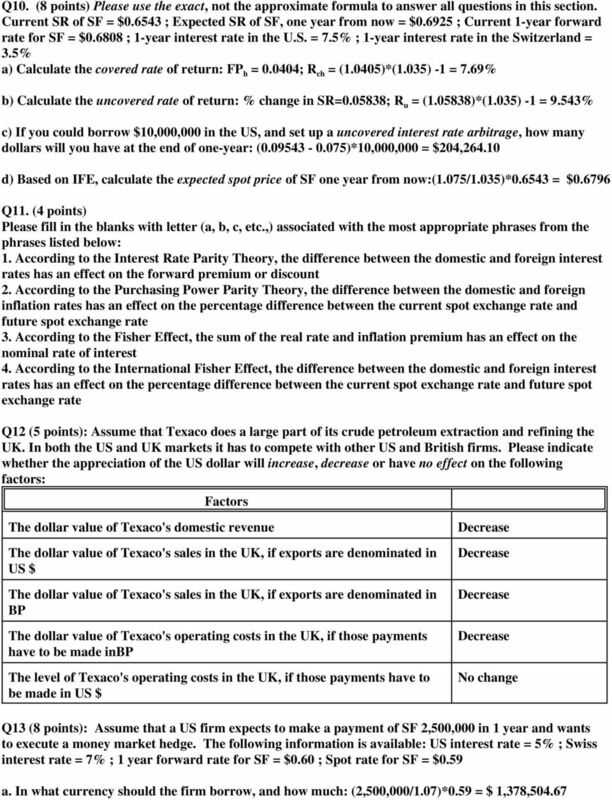 A) purchase a currency put option in British pounds B) sell forward contracts on pounds D) A and B 4. 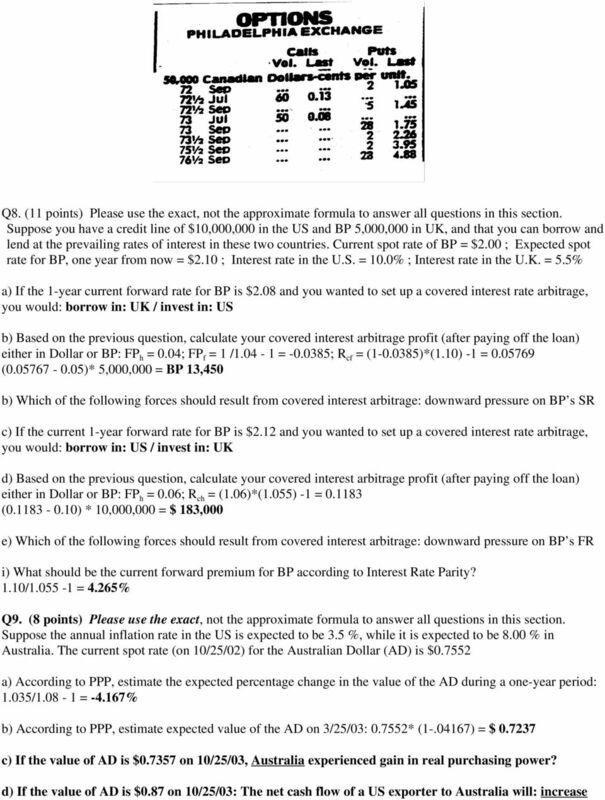 Which of the following reflects a hedge of net payables on British pounds by a US firm: borrow US dollars, convert them to pounds, and invest in a British pound deposit 5. Assume that Parker company will receive S200,000 in 360 days. Interest rates are 6% in the US and 5% in Switzerland. One-year forward rate for Swiss franc is $.50 and the current spot rate of Swiss franc is $.48. If Parker Company uses a money market hedge, it will receive $96,914 in 360 days. 1. Forward versus Futures Contracts. 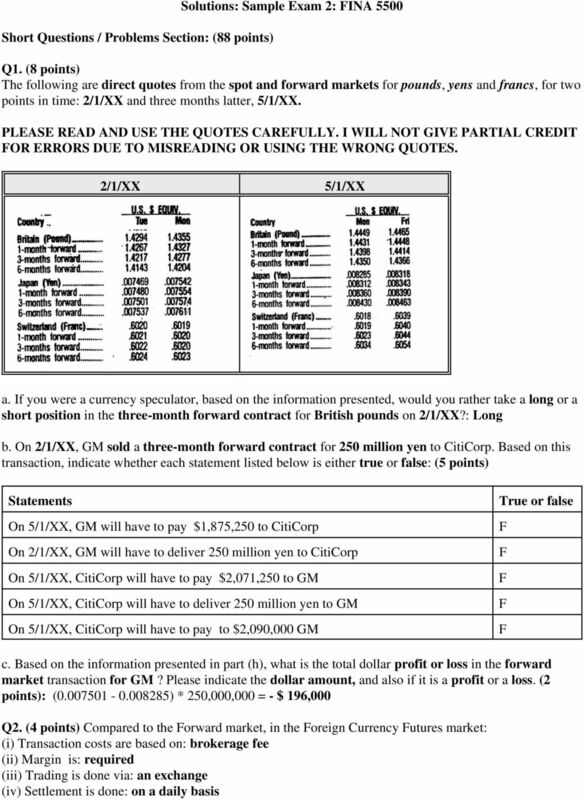 Compare and contrast forward and futures contracts. I reserve the right to include among the four questions one relevant question from the replies on chapters seven (the end of) & eight. International Financial Markets/1. Prof. Ian Giddy. What are the Global Financial Markets? Chapter 10. Measuring Exposure to Exchange Rate Fluctuations. Lecture Outline. Is Exchange Rate Risk Relevant? 3. Over the last 50 years, Canadian imports as a percentage of GDP have approximately a. stayed constant. b. doubled. c. tripled. d. quadrupled.